Floyd Mayweather (44-0 26KO) showed once again why he’s considered to be the best fighter in the world today by putting on a boxing clinic against respected challenger Robert Guerrero (31-2-1 18KO) to win the Ring welterweight championship and unify the division. Mayweather won by scores of 117-111 by all three judges. Before the fight, there had been legitimate concerns whether the undefeated fighter was finally starting to decline. After all, he is thirty-six years old, an age considered ancient in the sport of boxing and he got hit more than we’re used to seeing in his last fight against Miguel Cotto. By the third round of this fight, Mayweather proved any of those thoughts to be wrong. Guerrero had some success early as he roughed up his opponent and landed some nice body punches and left hands. 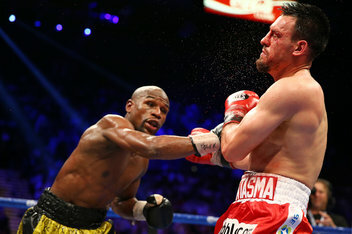 However, even at this stage of the fight it was clear that Mayweather was just as sharp as ever as his hand-speed and defense were already providing problems for Guerrero. By the third round, Mayweather had taken complete control of the fight as he popped his opponent with right hands and slipped away from the counter-shots Guerrero threw. Any time Mayweather found himself against the ropes, he would immediately go on the offensive and move away so as to not get pinned by Guerrero. This was in sharp contrast to the Cotto fight, where Mayweather seemed either unwilling or unable to get away from the ropes and was forced to fight with no escape routes behind him. The fight developed into the sort of pattern we are used to seeing in Mayweather fights: the undefeated fighter landing a high number of his punches and his opponent unable to land anything meaningful. A clubbing right hook in the eighth was the closest Mayweather came to scoring a knockout as he tried to land the kind of punch to close out a perfect night for him. Guerrero proved his mettle and courage by continuing to fight on and kept trying to win the bout but the difference in skill level and speed was just too much. After another dominant performance, most fans want to see Mayweather take on 154 Ibs. champion Saul “Canelo” Alvarez in his next bout. It would most likely be the most lucrative option for both fighters but nothing is official. As for Guerrero, no shame should be felt for losing to Mayweather. The man clearly has talent and should bounce back from this momentum killer fairly successfully. He can still be a force in the welterweight division and has a good chance of beating anyone not named Mayweather. The other winner in this story was Showtime. Mayweather is contractually obligated to fight five more bouts on the network, which will no doubt boost the amount of viewers and money the cable network makes. Only time will tell if Showtime’s gamble pays off but it’s off to a good start. Canelo is three divisions heavier than Mayweather when he fights, and that pretty much makes the fight impossible to make. When you’re talking about having a light heavyweight [Canelo] fight a welterweight [Mayweather], it’s not a fair fight. I’ve said this before, but I’ll say it again; when we start seeing Canelo matched up against fighters that are 20 to 25 pounds heavier than himself at cruiserweight, then there’s point in asking Mayweather to fight an opponent like Canelo, who is 20 to 25 pounds heavier than him. Thanks for your comment and sorry it took so long to respond. Anyways, the weight difference is a legitimate concern that makes a fight between these two [Mayweather and Canelo] unlikely. I brought up the match-up because it seems to be the one the majority of people are demanding. Mayweather will probably try to take on a fellow welterweight instead, considering it’s his best weight right now. Even though he’s won both his fights at junior welterweight [154 Ibs.] he looked less than himself in both fights. There have been talks about Canelo fighting the likes of Chavez Jr. [who is basically a cruiserweight] but nobody seems to call him a ‘coward’ for not fighting him. Canelo will more likely than not another junior welterweight [Cotto, Martirosyan, etc.] until he can no longer make the weight limit and moves up to middleweight.